Chris Morris’ Woodford Reserve Master’s Collection has always been a sandbox of experimentation for the brand. Each year, Morris riffs on the core Woodford whiskey by altering one of their “five sources of flavor“, including changing up the grain, water, fermentation, distillation, and aging. Some years the Woodford Reserve Master’s Collection is a grand slam home run (i.e. Maple Wood Finish and 4 Grain) while others miss the mark (Woodford’s Classic Malt). Hit or miss, the Master’s Collection provides a feedback loop for the brand, press, and Woodford’s most loyal consumers, which has been invaluable to the brand and has served as the foundation for Woodford’s biggest innovation, Woodford Double Oaked. When Woodford announced this year’s Master’s Collection release, we did a little bit of a double take. One of Chris Morris’ more controversial releases in the Master’s Collection was a whiskey finished in Sonoma-Cutrer Chardonnay barrels. Although initially slammed by the media and rejected by the whiskey faithful, Woodford’s Sonoma-Cutrer, according to Morris, has become one of the most requested releases in the history of the collection. 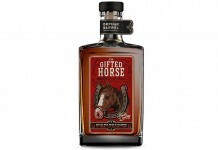 Since Morris has a long standing policy of not repeating his experiments, this year’s Master’s Collection release uses a Sonoma-Cutrer Pinot Noir barrel instead of Chardonnay to finish this Woodford Reserve whiskey. 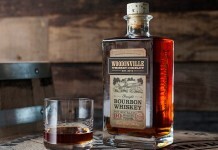 The brand points out that this year’s Master’s Collection isn’t technically a bourbon, as it doesn’t meet the requirement that bourbon be aged in “new, charred, oak barrels”. 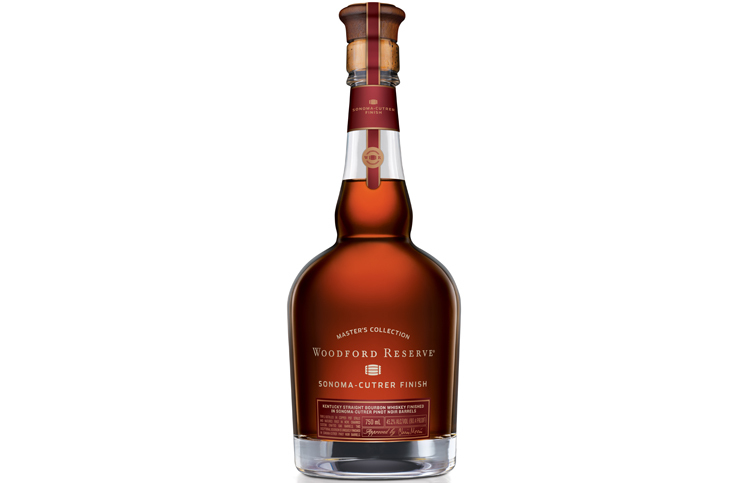 Woodford Reserve Master’s Collection Sonoma-Cutrer Finish (45.2% ABV / 90.4 Proof, $99.99 for 750ml) – dark amber in color, the nose on this year’s Master’s Collection leads with solid oak. Beyond the oak is marzipan, tart black cherry, cinnamon, and strong black pepper. The entry is bursting with flavor and leads with unmistakable pinot noir wine notes, including tart cherry, slightly sour grape, and blackberry. Although the impact of the pinot noir finishing barrel is strong, the flavor notes are very well balanced by Woodford’s core notes of cinnamon, caramel, marzipan, and oak. As we move towards the midpalate the character shifts from fruity towards spicy with clove, allspice, strong cinnamon, and black pepper. Underneath this spice is a strong tartness from the pinot noir finish that reads as tart cherry. The finish for this year’s Master’s Collection is long, slightly sour, and dry with oak and spice lingering on the palate. Like Chris Morris’ last adventures with wine barrel finishing, the Woodford Reserve Master’s Collection Sonoma-Cutrer Pinot Noir Finish whiskey is unique. The combination between Woodford’s Reserve Whiskey and Pinot Noir wine is an interesting one, and honestly one that we didn’t love right out of the gate. Unlike last year’s Classic Malt release, which was nothing short of a train wreck, the craftsmanship here is unmistakable with fantastic balance and integration of flavors. This release is absolutely the kind of whiskey that grows on you, and after spending a good hour with the spirit, it did finally win us over. 87 points. Like Chris Morris' last adventures with wine barrel finishing, the Woodford Reserve Master's Collection Sonoma-Cutrer Pinot Noir Finish whiskey is unique. The combination between Woodford's Reserve Whiskey and Pinot Noir wine is an interesting one, and honestly one that we didn't love right out of the gate. Unlike last year's Classic Malt release, which was nothing short of a train wreck, the craftsmanship here is unmistakable with fantastic balance and integration of flavors. 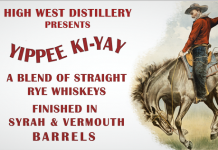 This release is absolutely the kind of whiskey that grows on you, and after spending a good hour with the spirit, it did finally win us over.